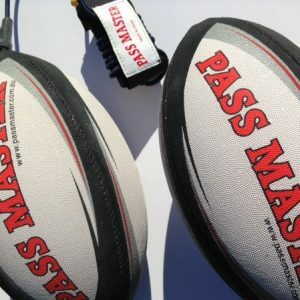 The Pass Master Rugby Ball is the Only True Training Football on the market today. Rugby Training ball – Increase your Football Skills Fast!!! Our rugby training balls allow you to Practice Core Basic Skills, such as kicking, passing, throwing and also kicking for goal – even when you are alone at home or in the park. You will find that this training football will greatly improve your Hand/Eye Coordination, Sensory Coordination and also your Confidence, HELPING YOU to become a Much Better Player on the Field. Rugby is a fast paced, full contact sport, much a game of skill as it is a game of strength. This sport is very popular in Australia, particularly in New South Wales and Queensland, and it is played by children and adults of all ages. Here at That Training Ball, we stock a rugby league ball on a string that offers players a convenient way to hone their football skills FAST!!! Made from high quality 3 ply pro-grip material, these rugby league balls are made to last. The ball attaches to your wrist via a comfortable wrist band and the bungee cord stretches up to whopping 4 metres. 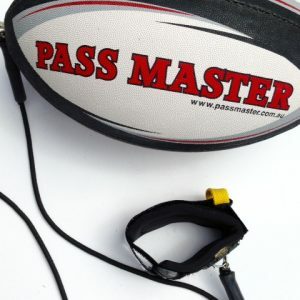 The rugby league training ball is connected to the cord via a metal swivel, allowing it to spin – an essential feature if you are to learn the correct way to handle it. At present we only have the MOD Size in stock for players age 5-13 years, unfortunately the full-sized ball for older kids and adults is out of stock. We would like you to make our rugby ball on a string part of your training program today – you will see some Amazing Results in just a few minutes. For more information, take a look at our videos and ORDER a Rugby Training Ball Today. 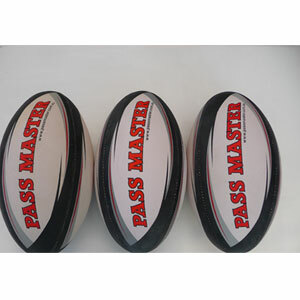 The Pass Master footballs are Australian designed and ONLY sold Online. If you have any questions, please feel free to contact us at That Training Ball. Overseas customers are welcome. We ship all Pass Master and Mark Master training footballs to customers and football clubs all over the world.